Indian Desserts fulfil everybody’s craving for a sweet-something in the most creative and delightful ways. While Indian desserts and sweets are predominantly served at the end of a meal, some Indian cultures believe in serving Indian sweet at the beginning, while some world cultures don’t have the concept of a dessert at all, and others like to top off with light fruits instead of rich sweets. In any case, who can resist pampering themselves with a dessert? So, always pay attention to this course of the meal. Fortunately, this is not a tough challenge because as far as desserts go, we have just too much to choose from! Indian desserts are mainly made using milk and sugar, khoya or milk powder, sweetening agents like jaggery or sugar syrup, aromatic spices like saffron and cardamom powder, mixed dry fruits, chenna or cottage cheese etc. India having people from various region and culture, celebrate a number of festival with great zeal. There are some or the other Indian desserts for every special occasions. Til Laddu is a popular sweet during Makar Sankranti, lord Ganesha is worshipped during Ganesh Chaturthi lovingly with his favourite mithaais like Modak and Churma Ladoo and then there is Jalebi that is enjoyed along with fafda, sambharo and besan chutney on Dassera day. Maharashtrians make Puran Poli for Gudi Padwa and Kaju Katli and Mawa Karanji are much sought after during Diwali. Gulab jamuns, Milk pudding, Kopra Pak, Kalakand are other popular Indian sweet recipes. When we think of Indian sweets or mithai the first thing that comes to our minds is barfi. An easy Indian Dessert recipe, Besan Barfi, has very few ingredients and takes very little time to cook, yet it has a rich taste and awesome aroma of cooked besan (chickpea flour). The Almond Barfi made with loads of almonds is super healthy, and gives you a good shot of protein! You can even make barfis in the microwave oven and you will be amazed by how easy and quick it is! Paneer is a handy ingredient in the preparation of sweets as well. Paneer and cheena are made by curdling milk and the only difference between them is paneer is drained to lose all the moisture and form a block. Though it can be used to make quick and easy indian desserts especially Bengali sweets like the Bengali Rasgulla or Saffron Chenna Pie. Paneer imparts not just softness but a very interesting, crumbly mouth-feel, which lands quite richly on the palate. With their intense flavours and rich textures, mithais like Badam ka Sheera, Moong Dal sheera and Rava sheera have become timeless treasures! Rava sheera is a famous prasadam made during Satyanarayan puja in every household. You can never say no to delights like besan ka sheera and this super quick Atta ka Sheera made by mixing flour sugar. One bite and you cannot stop! Halwa by itself is a delicacy that none can resist, thanks to its rich, sugary taste and enticing, melt-in-the-mouth texture. The most popular is Anjeer Halwa made from pureed figs. Come winter and everyone is waiting for a bowl of hot gajar ka halwa made using grated carrot or doodhi ka halwa. It can be enjoyed anytime of the year and we are sure the unique texture and rich flavor will linger in your palate and memory for a long time thereafter. The most famous traditional favourite kheer recipe in India is Rice Kheer which is made for special occasions like weddings in the South. Then there is also the South Indian Kheer, Paal Payasam where there is a long queue at the Kerala temples for this prasad. Other than this, you can make different kheers by combining fruits like apple, strawberry or mango to make lip-smacking fruity kheers. Kulfi is an Indian ice-cream made of thickened milk, reinforced with spices and dry fruits, and frozen in moulds. On every Mumbai major street corner and restaurant you will find irresistible Malai Kulfi, especially on a hot summer day. Also, you can perk up the simple kulfi to make Kulfi and Jalebi Sundae, Kesar Kulfi Falooda. From cakes, sundaes and ice-creams, to fruit-based desserts, puddings, cheesecakes and Indian mithai, there are endless options. It is nice to prepare Indian dessert recipes at home rather than buying them from outside because you can customize them to your preferences. This section will help you explore the world of desserts and try your hand at traditional and innovative ones. 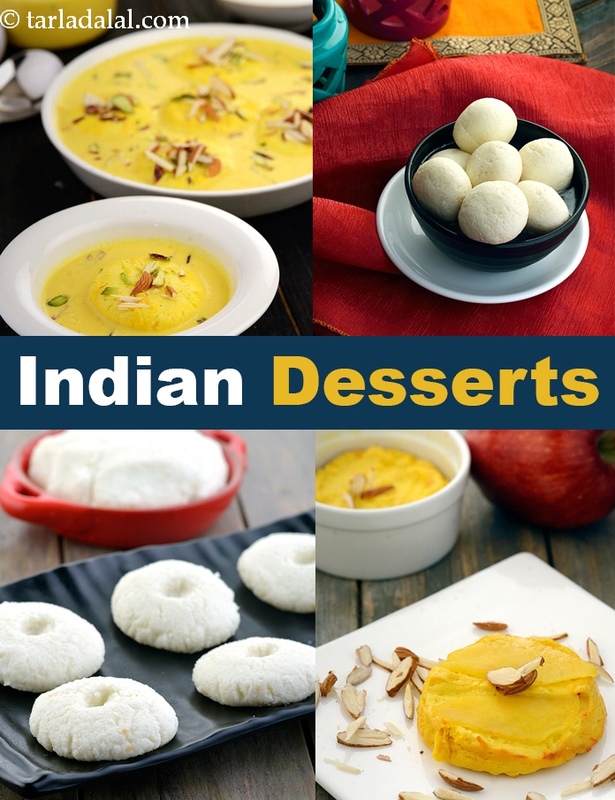 You will find a large collection of 2,000 Indian Dessert recipes to enjoy. Look below for our other Indian Sweet articles.